My second week in Alaska a small group of us traveled to Kanuti Hot Springs. You won't find these hot springs in any travel brochure or tourist website however. Aside from my friend Ed's blog and a government site, there is very little mention of Kanuti Hot Springs...anywhere. Needless to say it was quite remote, four and a half hours north of Fairbanks and 14 miles away from the highway along the Kanuti River. I wondered how Ed found it in the first place! 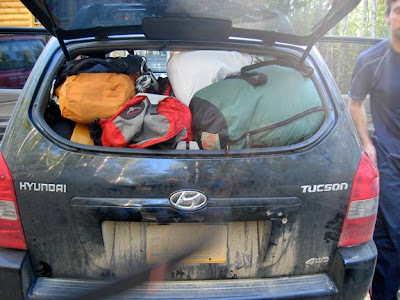 Dan C's Car packed with five people, one dog, five rafts, five packs, gear and a lot of miles ahead of us! Ed and his friends did this trip last year around the same time. Five of us went on this trip, plus Sky, Dan C's beautiful dog. 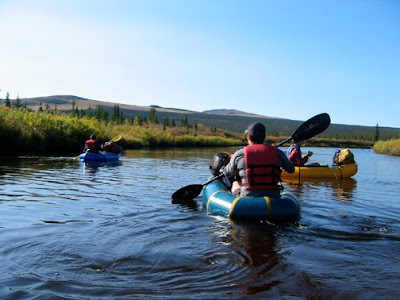 The plan for the trip was to drive the 4.5 hours north of Fairbanks on the Dalton Highway, camp by the river on the first night and paddle 14 miles down the Kanuti River the following day. 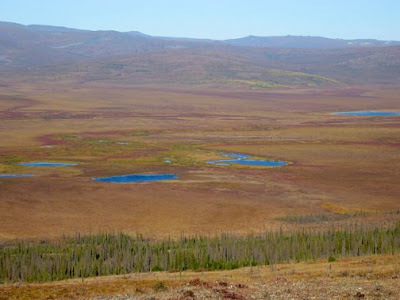 Then we would camp at the hot springs the second night and hike about 12 miles over Caribou Mountain and the surrounding peaks back to the truck. I thought it would be difficult: I had no idea how difficult it would be. The previous week I had hiked with Ed out to Bus 142 on the Stampede Trail. That hike was about 20 miles each way with two river crossings, but the trail was unmistakably there as it is used by dog mushers and ATVs quite regularly. The Kanuti trip had no such path for us to follow, which made it all the more exciting. 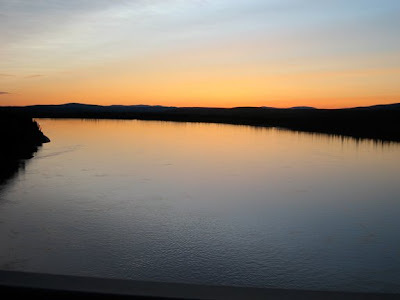 The landscape north of Fairbanks, especially with the sun going down, was rather eerie and disquietingly beautiful. There were no lights except from the sun and thus the land seemed ready to swallow the sky in blackness. It felt quite alien, as though I was on another planet. Once we arrived at the spot by the river where we were to camp the first night, Dan P, Lisa and myself drove about 10 miles further to reach the Arctic Circle. 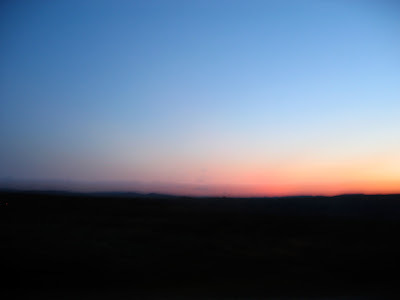 It was hard to believe that the sun had set at midnight. 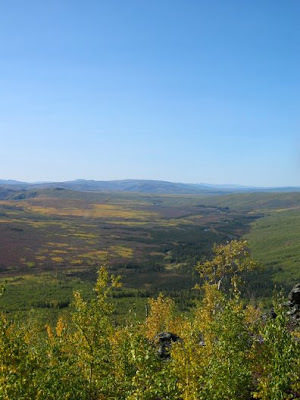 The Dalton Highway has quite a history and is frequented by truckers and intrepid travelers alike. 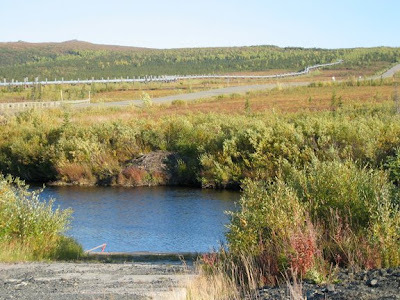 The Alaska pipeline ran parallel to a good portion of the highway. Quite a sight to behold. The land seemed endless, with distant horizons and crystal clear air. 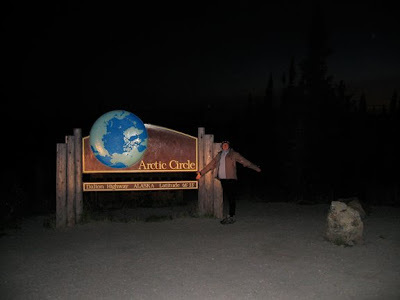 The official sign indicating The Arctic Circle. We made it! The next morning we headed out in our packrafts towards the hot springs. Ed said that the previous year they had rounded a turn in the river and had seen a mother bear and her cub. Fortunately we did not encounter any bears on this trip but their presence were always in the back of my mind. We each had a little Alpacka Raft, the secret weapon that enabled Ed and I to get to Bus 142 the previous week. We inflated our rafts and set them in the water awhile before we left as the cold water would cause them to deflate slightly. 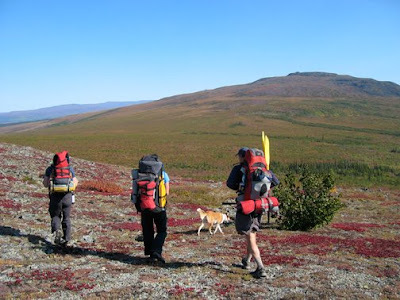 Once we tied our packs to the rafts and broke camp we were off, heading away from the highway, and civilization. 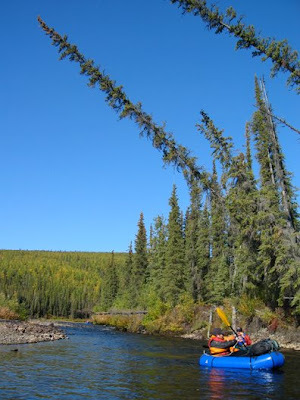 Here you can see where we set out from on Kanuti River in the rafts. 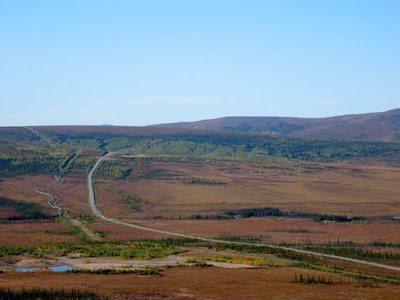 The Dalton Highway and the Alaska Pipeline are in the background. Away we went. At the start of the rafting the water was nice and deep. However as the day progressed and we came across more rocks in the river, I had to continue to get out of the raft and carry it across barriers that I could not get around. This led to much shaking of my fists, gnashing of teeth and testing of my patience, but I did it. Ed said that the year previous the water had been about six inches higher, which would have made the paddling quite a bit easier on this trip. The scenery was stunning and the knowledge that there was no one around for who knows how many miles, was humbling, intimidating and exhilarating. I had never before been so acutely in the middle of nothing and everything at the same time. 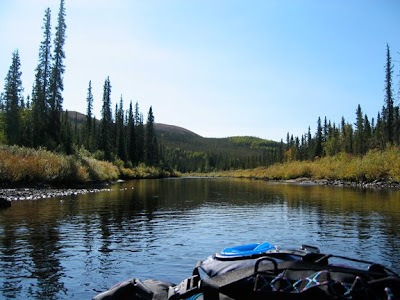 The view down the river from the raft with my pack fastened to the top of it. These trees seemed ready to fall on us as we paddled past. 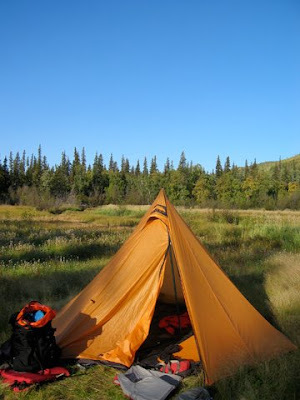 Our tent in the meadow by Kanuti River. 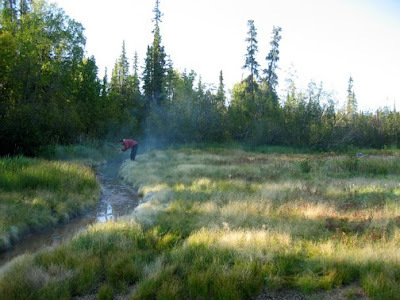 We arrived at the end of our paddle at about 9:30pm and made our way to a meadow next to which the springs run. There was wild onion all through the lea that we enjoyed the aroma of.This was due to the ground being heated by the hot springs. Thus we didn't need our super warm sleeping bags due to the more temperate climate. I slept like I had never slept before in my life, knowing that the hike the next day would be extremely challenging. Here you can see the mist rising from the hot springs. Everyone else went in the hot springs after dinner but I was so tired that I went to sleep straight away. You can see the meadow with the hot springs as the small green smudge below the darker trees. We headed out the next morning and bushwhacked for about a mile uphill, over dead trees, with packs (and rafts in those packs) on! I had never done anything like that before and I quickly became aware of how much more conditioning I needed!! My body wanted to give out very quickly but my will never did. 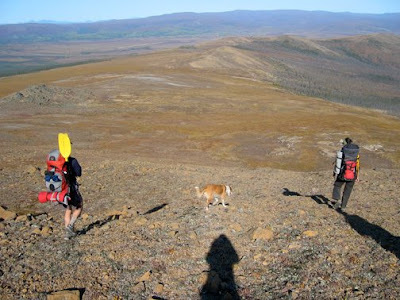 We traversed a succession of smaller peaks and eventually over Caribou Mountain. We encountered miles of tussocks which are designed to twist one's ankles I am convinced! The landscape was breathtaking and the fall colours were out in full force. To see 360 degrees of wilderness was unbelievable. 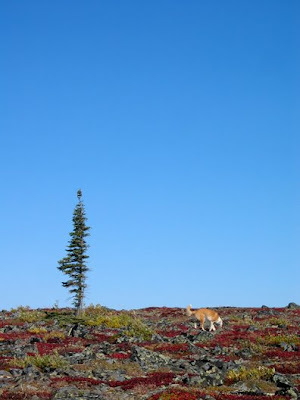 Climbing Caribou Mountain. We actually saw a caribou on the mountain. Sky took off after it but was left in its dust as the large buck took off across the taiga. Sky was in her element out there. She didn't like the Alpacka rafts very much but when we were on foot she was thrilled to experience the hike with us. 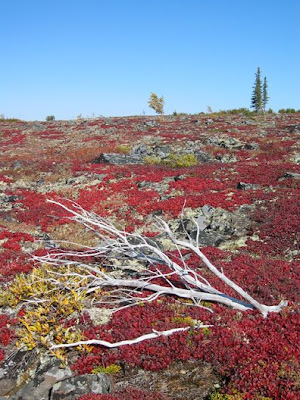 A beautiful contrast of colours blanketed the landscape. 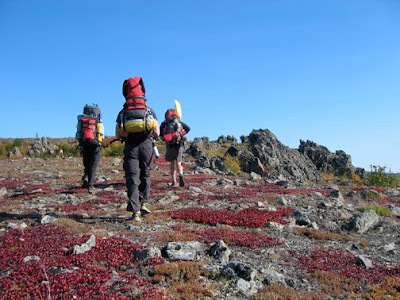 We feasted on bearberries, crowberries and blueberries as we hiked. Here we were about to enter the "saddle" portion of the hike. This saddle of land was composed of the dreaded tussocks, plants with the frustrating growth habit of being structured like wobbly cylinders that makes walking across them virtually impossible. Ed enters a race each year where they sprint across miles of tussocks. Yes, I am convinced that he is superhuman. We came over the last rise of land and saw miles of beautiful ochre coloured earth below us. The entire hike took us about 7.5 hours. I remember looking around and breathing the pure air unblemished by pollution and seeing the blue atmosphere reflected perfectly in the small lakes below. 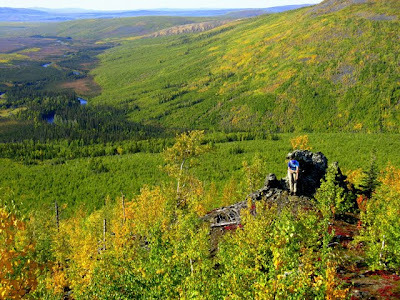 The entire palette of colours in Alaska are forever locked in my memory....the hunter green of the river, the cranberry and white mountain and surrounding hills, the ochre-filled descent back to the truck and the cerulean hued lakes and sky will be a part of me always. These lakes were like saphhires on a necklace below us. You can see the Alaska Pipeline here hugging the Dalton Highway which continues north all the way to Prudhoe Bay at the Arctic Ocean. After we reached the truck and packed ourselves in there was one last stop before returning to Fairbanks. 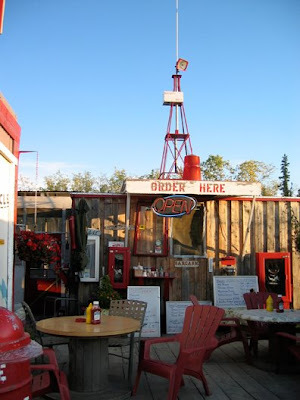 The Hot Spot, an eclectic assortment of signs, personalities and food is a popular rest spot along the highway. Stopping at the Hot Spot is a Kanuti tradition and to my delight I discovered that they actually had a vegan option! The famous Hot Spot diner. 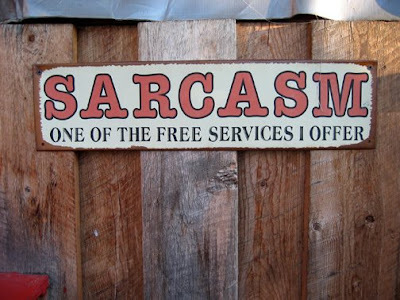 This sign hangs directly below the window where you place your order. 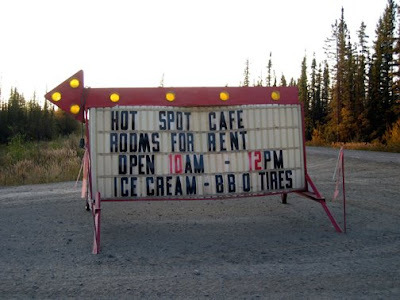 The Hot Spot seems to offer a bit of everything. Looking back on The Kanuti River trip now I realize just how much it really did broaden my horizons as a human being and an artist. While I did not go on this rafting trip to gather reference for paintings, I went to see if I could do it and enjoy the experience of that effort. While I was very frustrated at times, I used this discomfort in a positive way. I knew that if I could do this, I could do anything.